A recently discovered comet will make an uncomfortably close planetary flyby next year — but this time it's not Earth that's in the cosmic crosshairs. 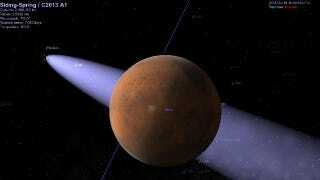 According to preliminary orbital prediction models, comet C/2013 A1 will buzz Mars on October 19, 2014. Early calculations suggest that the chance of impact is low — but that could change as new data emerges. The icy interloper is thought to originate from the Oort Cloud, a hypothetical region surrounding the solar system containing countless billions of cometary nuclei that were outcast from the primordial solar system billions of years ago. We know that the planets have been hit by comets before (e.g. the massive Comet Shoemaker–Levy 9 that crashed into Jupiter in 1994) and Mars, in particular, will have been hit by comets in the past. It's believed Earth's oceans were created, in part, by water delivered by comets — cometary impacts are an inevitable part of living in this cosmic ecosystem. C/2013 A1 was discovered by ace comet-hunter Robert McNaught at the Siding Spring Observatory in New South Wales, Australia, on January 3. When the discovery was made, astronomers at the Catalina Sky Survey in Arizona looked back over their observations to find "prerecovery" images of the comet dating back to December 8, 2012. These observations placed the orbital trajectory of comet C/2013 A1 through Mars orbit on October 19, 2014. Could the Red Planet be in for a potentially huge impact next year? Will Mars rovers Curiosity and Opportunity be in danger of becoming scrap metal? It seems the likelihood of an awesome planetary impact is low — for now. According to calculations by NASA's Jet Propulsion Laboratory (JPL), close approach data suggests the comet is most likely to make a close pass of 0.0007 AU (that's approximately 63,000 miles from the Martian surface). However, there's one huge caveat. Due to uncertainties in the observations (the comet has only been observed for 74 days), it's difficult for astronomers to forecast the comet's precise location in 20 months time; comet C/2013 A1 may fly past at a very safe distance of 0.008 AU (650,000 miles). But to the other extreme, its orbital pass could put Mars directly in its path. At the time of Mars close approach (or impact), the comet will be barreling along at a breakneck speed of 35 miles per second (126,000 miles per hour). Also, we don't yet know how big comet C/2013 A1 is, but comets typically aren't small. If it did hit, the impact could be a huge, global event. But the comet's likely location in 2014 is also highly uncertain, so this is by no means a "sure thing" for Mars impact (Curiosity, you can relax, for now). One thing is looking likely, however. Mars could be in for its own "cometary spectacular." A flyby of that distance will mean that should C3/2013 A1 erupt with a tail and coma around its nucleus (as it becomes heated by solar radiation), our Mars rovers and orbiting armada of planetary observation satellites will have a very intimate view of this historic moment. It has the potential to be a more impressive sight than Comet ISON's inner-solar system trek later this year. But understanding the nature of comets is hard to predict; we won't know if the sun's heating will be sufficient enough for the comet nucleus to erupt and start out-gassing for some time to come. Sources: JPL, Astroblog, LOC Astronomy via Reddit. This article originally appeared at Discovery News.